Intersections should be designed to maximize pedestrian safety and quality. Many factors inﬂuence pedestrian safety and quality at intersections. Street width, intersection geometry, signal timing, and the frequency of crossing opportunities all play important roles in achieving a pedestrian-friendly environment. appropriately reﬂect the street and transportation context. A. Visible crosswalks: Well-marked, visible crossings should be provided to alert drivers to the fact that they are approaching a location where they may encounter crossing pedestrians. In some cases, raised or colored crossings may be appropriate. B. Parking Restrictions at corners: Restricting parking adjacent to corners makes pedestrians and vehicles approaching intersections more visible to one another. C. Crossing aids: Accessible pedestrian facilities such as curb ramps and accessible pedestrian signals should be provided. D. Tight curb radii Curb radii for turning vehicles should be minimized to shorten crossing distances, increase pedestrian visibility, and slow turning traﬃc. E. Curb extensions: The installation of curb extensions should be considered in areas with high pedestrian volumes to reduce crossing times, increase pedestrian visibility, and slow turning traﬃc. F. Median refuges: Where medians are present or space otherwise exists, median refuges should be provided up to the crosswalk to provide a space for crossing pedestrians who may not be able to cross the entire roadway before the end of the walk phase. G. Roadway and pedestrian lighting: Intersections should be well-lit at night to improve visibility for all users. Suﬃcient lighting to illuminate crossing pedestrians should be provided. 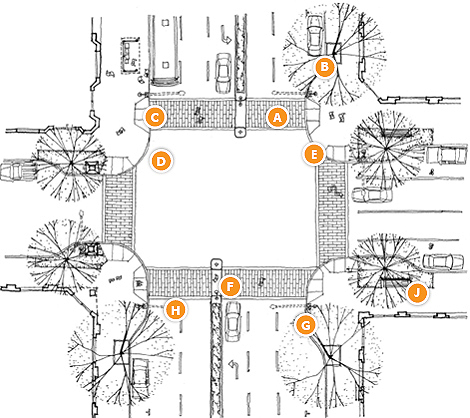 H. Streetscape elements: Streetscape elements, including trees, plantings, and seating should be provided adjacent to intersections to enhance the character and quality of the public realm and the sense of an intersection as an important public space. Not Pictured: Traﬃc calming features: Intersections may contain traﬃc calming features such as traﬃc circles to slow vehicles and enhance neighborhood character. Good intersection design provides a number of pedestrian-oriented features, such as well-marked crossings and curb extensions.